Buying and owning a home gives an individual a sense of accomplishment. In the inner circles of many people, owning a home is the only thing that makes you a “real” person. Shelter is a necessity of life and purchasing a home knocks off one of the most important things you need in life. The question that arises is how much is one willing to pay in order to own a house. Traditionally in North America, home ownership has always been the dream. It meant that no price was too high to pay to own a home because it was the main thing to strive for in life. However, in 2008, many Americans found out the hard way that over leveraging oneself financially in order to get a home was not a prudent idea. Many middle class families suffered real losses when housing prices tumbled substantially which was due to the result that many home owners didn’t understand just how expensive it was to maintain a home. In the past, it was suggested that individuals should never spend more than 30% of their average monthly gross income on shelter. 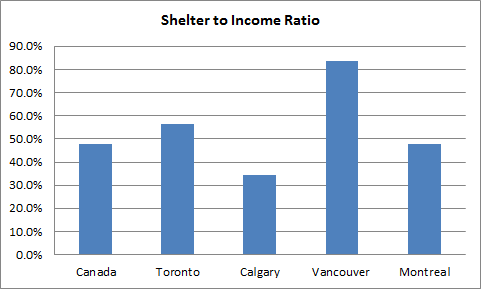 This became known as the Shelter To Income Ratio (STIR). It’s quite simple to calculate this ratio. Take how much you make in any given month without deducting taxes. This means you are not using what you actually get paid on your paycheque but what you would theoretically get if taxes and deductions were not taken out. Shelter costs don’t just include mortgage payments. Other costs associated with owning a home is included such as taxes, utilities and maintenance (Statistics Canada). Many would be home owners neglect the fact that there are many other expenses to owning a home than just their regular mortgage payments. These sticker shock items are the things that really push people to the brink with their finances on a monthly basis. Many Canadians point to the fact that they are stretched thin on a monthly basis because costs have been increasing for the everyday necessities in life. This remains true, but the real financial burden of many families have become their homes. Despite the 30% rule that exists as a benchmark for affordability, many families have ignored it and have gone above and beyond the sustainable carrying costs of home ownership. A recent RBC report on home affordability shows that the shelter to income ratio for detached single family homes in Canada stands at 47.8%. The more astonishing numbers shows up when large metropolitan cities like Toronto and Vancouver are considered. Both these two cities have shelter to income ratios at 64.2% and 85.6% respectively. If we consider just for a second that Canadians are some of the most taxed citizens on the planet and the STIR is calculated using gross income and after tax net income and it would not be surprising to realize that the average citizen living in the two most expensive cities in Canada are literally working just to pay off their homes. There is very little money left over for leisure activities. Many individuals who try to become home owners ultimately sentence themselves to a financial prison for life of paying off their homes. A popular complaint from the masses is that the cost of home ownership is being driven up by the large banks in Canada who provide the mortgages to individuals. Just the other day the Royal Bank of Canada reported annual profits of almost $9 billion dollars. The other banks followed suit with very similar record breaking profit numbers. Does this mean that the banks are the culprit for high housing costs? Certainly not. home owners but it’s not because the interest rates are so low, it’s because people not the banks have been driving up the price of houses. Banks don’t set the price of a house. Buyers and sellers do. Regardless of how low interest rates get, if the price of the house is astronomically high, the banks’ profits will ultimately be higher. It doesn’t take a genius to realize that 3% of $900 000 is a lot more than 3% of $300 000. There are many benefits to home ownership. Many of them fall on the emotional side as opposed to the financial side that many individuals perceive. Whether or not home ownership is right for you generally comes down to your own opinion as to whether you are prepared to become a home ownership and take on the responsibilities that follow with it. Owning a home requires the same kind of responsibility as say having a dog or having a child. It needs to be nurtured, maintained and for sure it’s going to cost a lot of money. The one thing to take away is not to get carried away emotionally with trying to buy a home. Financially, a home should fit within one’s personal budget. This means that a house should not become a financial burden to the family or individual with monthly payments that would hinder the quality of life. One should also avoid buying a home that would take too long to pay off. Despite being called a mortgage, it doesn’t mean you should be buying a home that will take you a lifetime to pay. If you’ve read how amortized interest works, then you should know that you don’t want to make your life about paying the bank just to own your home. If owning a home isn’t for you, it isn’t the end of the world. I’ve written about how renting can be better than owning. If owning a home is something that you really want, then plan your finances accordingly and do your research first before taking the plunge. Buying a home will be one of the biggest financial decisions you’ll have to make in your life. Try to avoid financial suicide.